On March 11, 2011, the Japan America Society of Southern California created the 2011 Japan Relief Fund, a disaster relief fund to aid victims of the Great East Japan Earthquake and Tsunami. One hundred percent of the tax-deductible contributions to the 2011 Japan Relief Fund have gone to organizations that directly help victims of the disaster. To date, the fund has raised nearly $1.5 million. Our 2011 Japan Relief Fund Committee takes great care and conducts due diligence to research NPO/NGOs in Japan that can provide both immediate humanitarian relief and long-term recovery. The committee presents its recommendations for review, discussion and a formal vote of approval by the board of directors. The board has strictly followed the principles and guidelines of international charity outlined by the IRS and the U.S. Treasury. 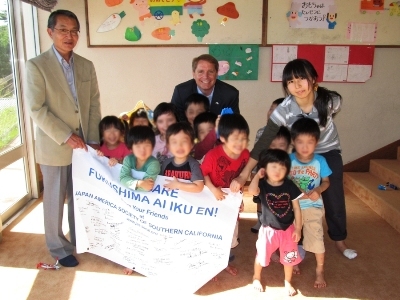 As an additional monitoring effort, six months after the earthquake the Society’s president, Douglas Erber, went to Japan to observe the performance of the organizations’ charitable activities in Japan to ensure compliance with expenditure responsibility rules under the tax law (please see the president’s Report from Tohoku). There have been several subsequent visits by the president and members of the board of directors. We are pleased to report the organizations that each received a tranche from the 2011 Japan Relief Fund provide first-hand reports and updates on how the funds have been, and continue to be, used to directly help the victims of the disaster. 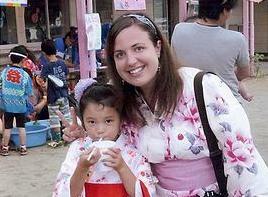 Taylor Anderson was an assistant language teacher in the JET Programme in Ishinomaki from August, 2008 until perishing in the March 11, 2011 Great East Japan Earthquake. Taylor loved her life in Ishinomaki and planned to return to the U.S. in August, 2011 and hoped to continue her relationship with Japan. Her fund was established to help students, schools and families in the Ishinomaki and Tohoku recover from the earthquake and tsunami as Taylor’s family expects Taylor would have wanted. It also pursues Taylor’s dream of being a bridge between the U.S. and Japan. 1. “Live Your Dream: The Taylor Anderson Story” – A film and video project in Ishinomaki, by Regge Life. 2. Smile Together Ishinomaki – provides programs to support different communities in various locations in Ishinomaki, Japan. 3. Taylor Anderson Reading Corners – Taylor’s fund has placed books in 29 schools and community center. Reading inspired Taylor to live her dreams and her family hopes these books and computer software will inspire her students to find and live theirs. 4. Smiles and Dreams: Tohoku Kids Project – provides long-term support for Asahigaoku Gakuen children’s home (orphanage) in Kesennuma. 5. Taylor Scholarships and Exchange – provides financial assistance to Ishinomaki high school graduates to attend Sendai YMCA College. 6. Hope for Tomorrow – supports the educational advancement and financial assistance to promising high school students affected by the disaster. 7. JET Micro Grants – provides financial support to enhance English language and foreign culture programs initiated by Miyagi/Sendai JET Programme participants. 8. The Fund for the Future – provides earthquake orphans from the 1st to 12th grades with up to 60 months of education support. “CORE HOUSE”, an award winning architectural design, this low cost, high quality, modular family home, was originally designed to replace the 600 homes lost to the tsunami along the Oshiki Peninsula in Miyagi prefecture. Core House construction also took place in Fukushima and Iwate prefectures. "Core House" Community Center for Minamisoma city, Miyagi prefecture. Connecting two Core Houses, this was the first new structure built high on a hill in the devastated area of Minamisoma City, Miyagi irefecture. It serves as a critical Community Center. Solar Panel System for the Momonoura “Core House” Community Center, located in Miyagi prefecture. The solar panel system now provides enough electricity for the community center’s annual operations. Excess electricity produced by the solar panel system is sold back to the Tohoku Electric Company. The estimated annual revenue from the sale of excess electricity is approximately USD $1,600. The estimated cost to manage the community center is USD $2,800. Thus, the solar panel system powers the community center, especially if there were another disaster cutting off electrical power, and it offsets a majority of the expenses required to manage the center. The remaining estimated USD $1,200 needed to manage the center is paid for by donations from the community. Solar Power System for a "Core House" Community Center in Tsukinoura, Ishinomaki city, Miyagi prefecture. Construction of the building was paid for by the East Japan Greater Earthquake Hyogo Prefecture Victims Committee. The Japanese Red Cross Society was founded in 1877 and has an extensive network of branches in cities, towns and villages throughout Japan. Its headquarters is located in Tokyo and local chapters are set up in all 47 prefectures. 15,530,000 individual and 220,000 corporate members belong to JRCS, which operates 92 hospitals and 79 blood centers across Japan. JRCS conducted relief activities for victims in the Great Hanshin-Awaji Earthquake which hit the Kobe area in 1995 as well as the 1923 Great Kanto Earthquake. Today, JRCS has a well-organized domestic disaster response system, with 488 response teams throughout the country and 6,844 medical relief personnel. Activities by JRCS volunteers include collection of information, first aid, provision of hot meals, tracing services, transportation and distribution of relief goods, and caring for those who evacuate to shelters. All funds received by JRCS will be transferred to the Distribution Committee, which is formed around the local governments of the disaster-affected prefectures, and the funds will be distributed directly among the affected population. The Imperial Family of Japan traditionally has supported JCRS, with the Empress as Honorary President and other royal family members as Vice-Presidents. Kizuna Foundation is a Japanese non-profit organization, and the successor to All Hands Asia Association (AHA), the legal operating entity in Japan of All Hands Volunteer, Inc., the US 501(c)3 registered humanitarian aid organization that focuses globally on volunteer driven disaster relief. 4. Promote volunteerism and civic activities. Kizuna Foundation maintains a state of readiness for disaster response and preparedness as secondary areas of focus. For so long as the needs arise, Kizuna Foundation intends to provide assistance to our Regional Focus Area for economic development and needs-based funding, and to address the social and civic needs that face Japan. 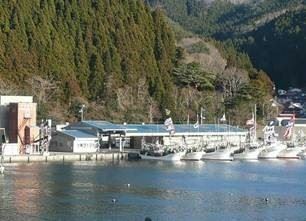 Support for the reconstruction of the Ryori Harbor Fisheries Facility located in Ofunato city, Iwate prefecture, and supporting one of Tohoku's largest fishing communities. Kizuna Foundation, through its government advisers and in cooperation with the local Fishing Cooperative, successfully received a 8/9th subsidy from the Japanese government. Thus, this project resulted in an 8:1 leverage of our $70,000 tranche from the 2011 Japan Relief Fund, for a total donation of approximately $560,000. Today, this fisheries facility supports more than 500 fishing boats. Restocking Music Instruments for Elementary and Junior High schools in Ofunato city, Iwate prefecture. The 2011 Japan Relief Fund partnered with the Asia America Symphony Association, each providing $25,000, for a total donation of $50,000. Living Dreams Japan is a program created under parent non-profit organization, International Educational Association for Children (IEAC). IEAC was founded on September 11, 2001 by Patrick Newell (also co-founder of Tokyo International School in Tokyo, Japan). The mission of Living Dreams Japan is to support children’s homes (orphanages) in Japan to help the children become responsible, confident and empowered young adults. After the March 11, 2011 earthquake, Living Dreams Japan teamed with Smile Kids Japan to create Smiles & Dreams: The Tohoku Kids Project, which works to support children’s homes affected by the triple disasters. Through this project, Living Dreams Japan works to restore basic necessities including clothing, baby supplies and basic medicines, as well as provide the children’s homes with items that will help rebuild a nurturing environment for the children; items such as toys, computers, books and supplies for a variety of hobbies. They also work directly with children’s homes and the government agencies responsible for them to best assess the needs of each and every home affected by the disaster. Furthermore, Living Dreams Japan will connect the children’s homes directly to professional child counseling services and will provide them with a wide range of activities to help improve the children’s’ mental health after the tragedy they’ve endured. Proper counseling along with activities such as trips to theme parks, camping, going to concerts, Yoga and various other types of therapeutic activities will improve children’s outlook on their lives and their future. Replacement of musical instruments and other musical materials for the Kamaishi Civic Wind Orchestra. Kamaishi city was at the center of one of the worst devastated areas in Iwate prefecture. The Kamaishi Civic Wind Orchestra lost all their instruments, music sheets and even music sheet stands in the tsunami. The ensemble is the only significant orchestra in Kamaishi and one that is beloved by local citizens. The recovery of the Kamaishi Civic Wind Orchestra was seen as very important for morale in Kamaishi and the surrounding region of Iwate prefecture. The Kamaishi Civic Wind Orchestra is comprised of 60 citizens and it performs regularly in the region and has won local competitions and musical awards. Kamaishi city is also the location of a major steel foundry of Nippon Steel & Sumitomo Metal. Through the Nippon Steel & Sumitomo Metal Arts Foundation, the 2011 Japan Relief Fund partnered with JASSC’s sister organization, Japan Society of Boston, to replace the music instruments and musical materials for the Kamaishi Civic Wind Ensemble. Save the Children has been working in Japan for 25 years. In the immediate aftermath of the disaster, Save the Children deployed emergency response teams to assess the needs of children and their families. Multiple child-friendly spaces have been established in evacuation areas where displaced families are staying. Child-friendly spaces provide children with an opportunity to play with other children while freeing up parents to work on the recovery. Additional child-friendly spaces are being established. Donations to the Japan Earthquake Tsunami Children in Emergency Fund will exclusively be used to help provide disaster relief and support for all affected children in Japan. In addition to immediate relief, this fund will help support long-term recovery plans to restore education and child care in communities in Japan ravaged by the disasters. Seikeijuku (“The Matsushita Institute of Government and Management”) was established in 1979 as a public nonprofit organization to develop and promote leadership for the 21st century. As a public nonprofit corporation, all contributions to Seikeijuku are tax deductable under Japanese tax law. Seikeijuku established its Tohoku Earthquake Fund with the sole mission of relief and recovery of those affected by the earthquake and tsunami. 100% of funds raised will be directly spent on relief and recovery efforts. The Tohoku Earthquake Fund is managed by the Seikeijuku Secretariat office, which is a separate public nonprofit corporation. It is allocating the fund’s resources to relief efforts not covered by existing large NPO/NGOs, and its Distribution Committee is consulting with the Governor of Miyagi Prefecture, The Honorable Yoshihiro Murai, an alumnus of Seikeijuku. Because Miyagi sustained the most severe damage of the three Northeastern Prefectures, the Seikeijuku Tohoku Earthquake Fund is focusing its relief efforts within Miyagi Prefecture. Seikeijuku will provide transparent and very specific details of how the Tohoku Earthquake Fund is being spent, as well as the effectiveness of its relief and recovery efforts.